A Crowd of Monsters' episodic adventure sticks a bit too close to a familiar style, but presents enough new ideas to make it worth investigating. It's amazing to think Telltale didn't just rescue the adventure game genre; over the past decade, they've essentially reinvented it. By eliminating puzzles entirely and putting a larger emphasis on narrative choices with the hugely successful The Walking Dead, Telltale proved the viability of episodic adventure games delivered via this highly accessible format—generating more than a few spiritual successors along the way. D4, Life is Strange, and the recent King's Quest reboot each use the Telltale adventure as their framework, but put a distinct spin on their competition's scene-by-scene approach. 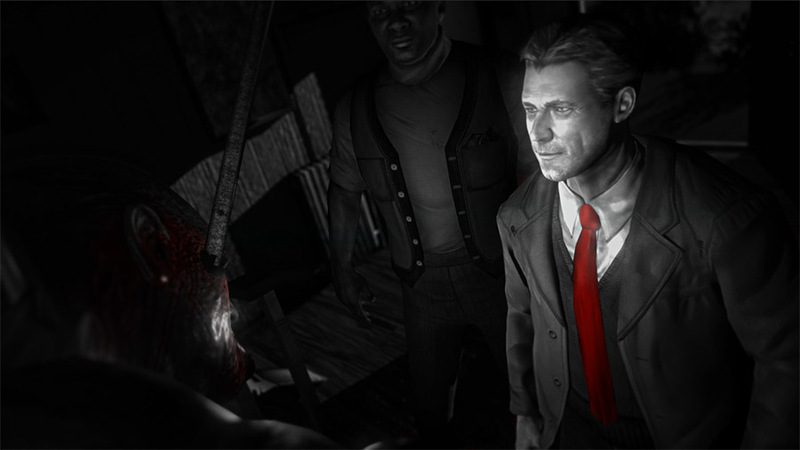 In a move that will surprise no one, A Crowd of Monsters' new adventure, Blues and Bullets, also follows this en vogue formula, and while it may adhere a little too closely to Telltale's house style, it brings enough new ideas to the table to make this film-noir-inspired adventure worth checking out. Set squarely in the middle of this film genre's most prolific period, Blues and Bullets casts its world in black in white—with some brief instances of red in what I've dubbed "Schindler's List-O-Vision"—and picks up on the life of former federal agent Eliot Ness 20 years after his nemesis Al Capone finds himself in jail for tax evasion. Ness now runs a cozy diner called—wait for it—Blues and Bullets, which isn't as crazy as it initially sounds; after becoming a private citizen in the real world, Ness jumped from business to business as he battled alcoholism. In Blues and Bullets, Ness finds himself dragged back into his old life when Capone—who apparently bounced back from brain-rotting syphilis—sends one of his men to recruit this former enemy when his granddaughter falls victim to a serial kidnapper still at large in the city. As far as historical fiction goes, Blues and Bullets' is just silly enough to not pull you completely out of its well-crafted world. If you've played a Telltale game, you should have a basic understanding of how Blues and Bullets plays out. Ness is dropped into a scene, and is only pushed into the next one when he interacts with the right objects or people. There's your standard QTE action scenes, of course, along with moral choices that promise to have an effect later down the line, but Blues and Bullets adds something new to the mix: brief, on rails shooting segments that feel like a throwback to Namco's Time Crisis. They're perfunctory and impossible to lose, but these bits do their job of adding a bit of action to the typically slow and studied pace of an adventure game. The amount of player freedom has always been minimal at best with the Telltale style, but Blues and Bullets offers even less wiggle room. Most scenes lead you down a direct path, which makes most of your actions consist of walking to the next thing you're supposed to interact with. At times, it felt like I didn't necessarily need to be there, so I was more than a little surprised when I encountered a section of the game that required some amount of brain power. At some point during Episode 1, you're asked to solve a murder mystery, which removes Blues and Bullets' normally tight leash and gives you free rein to explore an entire crime scene in search of clues. Anything you discover can then be plugged into an "investigation board," that, when complete, recaps the events of the murder in their entirety. Even though the mystery presented in Episode 1 isn't all that complex and can be brute forced if necessary—you're not punished for plugging the wrong evidence into the investigation board—it made for one of the best segments of Blues and Bullets, simply because the game needed my input. Thankfully, Blues and Bullets' style goes a long way in helping it overcome these issues. 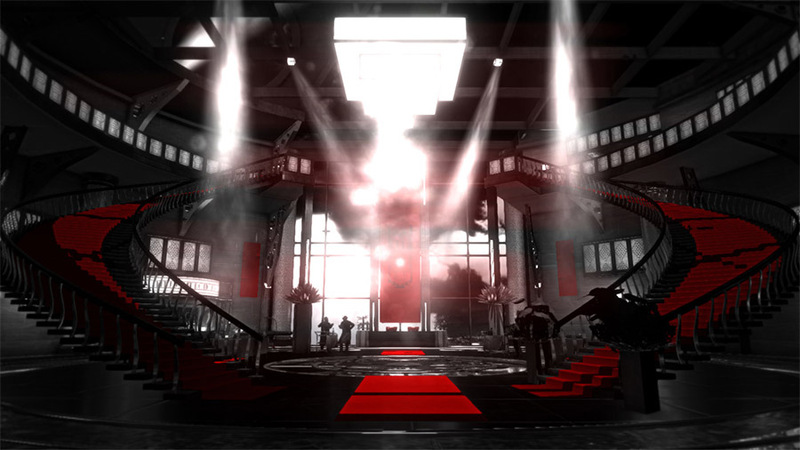 I wouldn't say it completely nails the film noir style, but going for black and white feels inordinately daring in a world where games like L.A. Noire make this appropriate aesthetic choice optional. Though the characters can look awkward at times, Blues and Bullets' environments look great, and artful camera angles and lighting effects only add to their visual appeal. There's also some interesting choices on display, even if they aren't entirely new: One scene finds Ness giving a monologue, and certain words emerge in bold white and red as he journeys forward into the darkness. Yeah, it's something we've seen in Max Payne 3, but B&B takes this idea one step further by turning this scene into an action segment where you can take cover behind Ness' spoken words as you engage with enemies. It's a pretty inspired idea. If a Telltale-style film noir adventure sounds appealing to you, then this first episode of Blues and Bullets shouldn't disappoint. Even if it tries to set up a bit too much in its three-hour running time, A Crowd of Monsters' incredibly reasonable price of admission ($4.99) makes investing in this episodic adventure an extremely minor gamble at best. Even if later episodes stay as on-rails as this first installment, I'll gladly drop the price of a burrito to get another three hours of film-noir atmosphere with a delicious murder mystery in the middle. If you've played a Telltale game, you should have a basic understanding of how Blues and Bullets plays out: tightly scripted scenes, moral choices, QTE battles, and not all that much interaction from the player. But its well-crafted film noir atmosphere—along with some honest-to-god puzzles—make this adventure more than just another copycat. Tagged with A Crowd of Monsters,	Blues and Bullets,	film noir,	Reviews,	Steam,	USgamer,	Xbox One. The BoxBoy trilogy pulls an Uncharted 4 with yet another sequel. Days Gone hides itself like its hero hides his emotions. Pack lightly for a jolly trip.